Adult baby teeth. A common problem. I finished a veneer case about a week ago. A full row of upper front teeth to cover this patient's adult baby teeth. Today, the lab manager gave me the news -- it was a huge success! The dentist called the lab after fitting the case and said the patient was so happy, she cried. It's not the first time I've made a patient cry with happiness, and this is always a great feeling for the patient, the dentist, and for me. This patient, an adult, had a mouth full of baby teeth. This is more common than you may realize. Not everyone loses their baby (or milk) teeth and has adult teeth grow in. The "before" picture below is not terrible looking. And luckily in her case, this didn't cause any health issues. But it was a nagging concern that undermined her confidence. It probably also made her self-conscious about her smile and what others thought about her. The veneers made a big difference in her smile. It's almost like we're looking at a fashion model's smile. But vanity does not always need to be empty and superficial. It's important for people to feel good about themselves, feel comfortable around others, feel confident, and hopeful of the future. Cosmetic dentistry does a tremendous job in this area. I've seen my share of positive and powerful transformations as an aesthetic dental ceramist. This patient was looking for a solution to a problem that concerned her for many years; most of her adult life. It was something that probably held her back in many small (or big) ways. 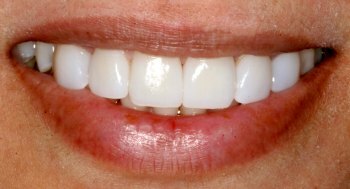 After consulting with her dentist, they decided on a treatment plan that included a full row of veneers for her upper teeth. Why only the upper teeth? By matching the dental impression I received from the dentist with the natural features of her mouth and face, I was able to create a set of authentic looking, aesthetically pleasing, and healthy "adult" teeth. Now she can gleam with pride.